Oh, definitely. There are simply too many animals in too small of a place. In a traditional farm, a sustainable farm, you grow both crops and animals. There is a pasture, and you have a certain number of animals per acre. But when you have 2,000 cows per acre instead of two, you have a problem. You can't fit them in a pasture  you fit them in a building. You can't grow enough crops to feed them  you have to ship in their feed. You don't have enough land to absorb their waste. It has nowhere to go. 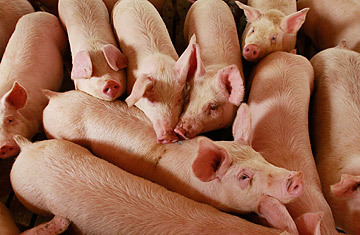 Hundreds of massive pig farms came into North Carolina in the 1990s. In Animal Factory, I tell the story of Rick Dove, a former Marine who retired and bought a fishing boat. One day he noticed the fish were dying in really weird ways. First there were the algae blooms. Algae creates oxygen during the day through photosynthesis and expels carbon dioxide at night. When that happens, there's literally no oxygen in the water. Everything comes crawling up to the shore in the shallowest part of the river, trying to pump water through their gills. By the morning, they're all dead. Everything  shrimp, crab, little fish called menhaden, eels, bass. People call it a "fish jubilee," 'cause they can just wade into the river and pick up free food. People probably assume this kind of stuff is regulated, but it's not. Or at least not enough. What should the government be doing? A lot of the laws are on the state and county level, so it depends on the political will and political culture of the individual state. That doesn't mean Democrat or Republican. That means agriculture state vs. a state with not a lot of agriculture. What kind of laws have agriculture-friendly states passed? Some states say that if a company spills its manure, it doesn't have to pay to clean it up. The taxpayers pay. If you try to pass pollution standards, the industry complains that they're already too heavily regulated. They claim that if you force them to reduce how much they pollute, they're not going to be able to operate. They're essentially saying they can only make money by polluting and breaking the law. That should be unacceptable to everybody. You spent three years reporting this story. What stands out? One time I visited a pig farm, a regular farm  not a factory farm  in Illinois. Right across the street was a hog CAFO. The owner didn't live there, of course. There's no farm house on a factory farm, just business offices. At night, all the workers would leave, and all I'd hear as I was trying to fall asleep was the sound of the pigs fighting each other, biting each other, squealing, screeching all night long. It was like nothing I've ever heard before in my life, and it just didn't stop. It sounded like kids being tortured over there. I'll never forget that sound. It was very sad.